The Atlassian Crowd team is pleased to bring you Crowd 2.11. This release brings significant performance improvements, as well as many bug fixes. We've improved license counting so that duplicated usernames no longer consume more than one license. This table shows some examples of the changes in the Crowd 2.11 license system. Generally, a consumed license is a unique username which can authenticate against one or more applications in Crowd. License count: 1, but user1 cannot authenticate, because was seen inactive in directory1. 2, but in fact only user1 from directory1 is able to authenticate against application1. 1, but in fact user1 is unable to authenticate at all, because user1 from directory1 is not present in any of authorised groups. With Crowd 2.11 you can easily check your logs for common errors and use our support resources directly from Crowd, using the new Support Tools functionality. We've improved LDAP user search speed, which provides a better experience during searches and synchronisation. 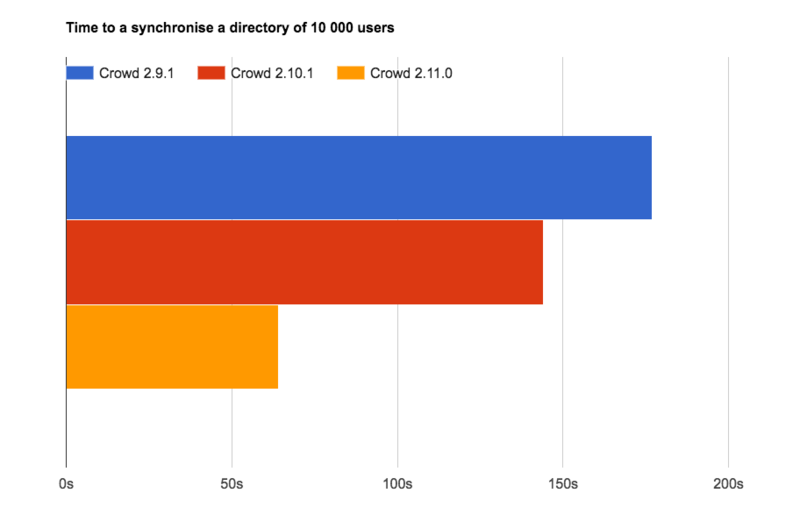 Example of average initial synchronisation durations of 10,000 user base for Crowd 2.9.1, 2.10.1 and 2.11.0. We've added support for MySQL 5.6 and 5.7, Postgres 9.5 and Microsoft SQL Server 2014. For a full list of supported platforms, you can check out our supported platforms page.